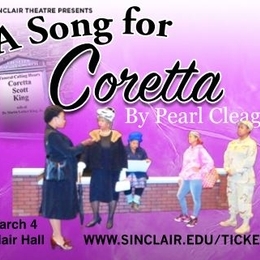 In honor of Black History Month, Sinclair Theatre is touring the play A Song for Coretta by Pearl Cleage to area schools throughout the community. The story of A Song for Coretta centers five fictional African American women who share their inspirations from Coretta Scott King. The production is made possible through a Sinclair Cultural Diversity Grant. A 20-minute selection from the show will also be performed as part of the NIA Awards, “celebrating leadership and good deeds with the purpose of uplifting African-American students on campus or citizens throughout the Miami Valley” in Blair Hall, Building 2 on Sinclair’s downtown Dayton campus on Friday, March 3. Then, the complete A Song for Coretta will be presented for two performances only, on Saturday, March 4 at 2:00 p.m. and 8:00 p.m., also in Blair Hall. Tickets are general admission and cost $8 in advance or $10 at the door (if available). Tickets may be purchased online now at www.sinclair.edu/tickets. Directed by Kimberly Borst, the cast includes: Furaha Henry-Jones, Sha-Lemar Davis, Erin Waldon, Bryana Bentley and Erin McGee.